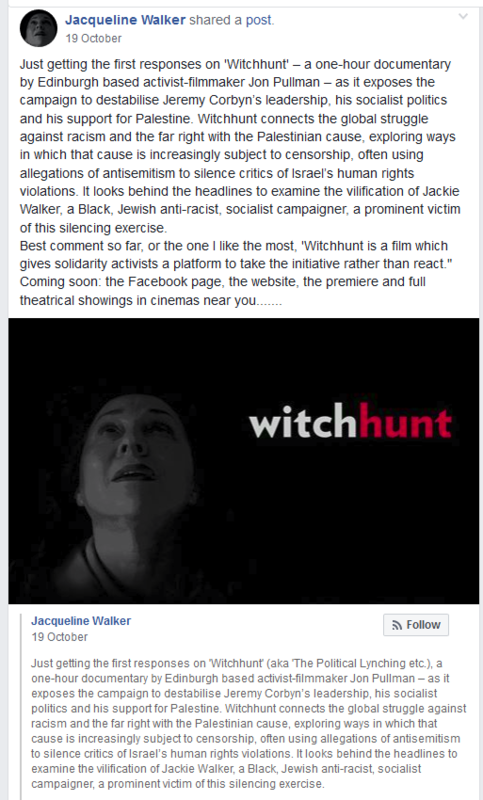 Jackie Walker’s case is, deservedly, one of the most notorious among those exemplifying the institutionalisation of antisemitism in the Labour Party. A former vice-Chair of Momentum, her initial suspension for repeating the Louis Farrakhan-inspired hoax that Jews were the “chief financiers of the slave trade” was lifted in secrecy and without public explanation, with that mysterious exoneration being swiftly celebrated with a public embrace from the Party’s leader, Jeremy Corbyn. She went on to be suspended a second time for comments misrepresenting the inclusivity of Holocaust Memorial Day and for challenging the need for security at Jewish schools. She has remained suspended for two and a half years, as the gears of the Labour Party’s disciplinary system ground to a near halt. 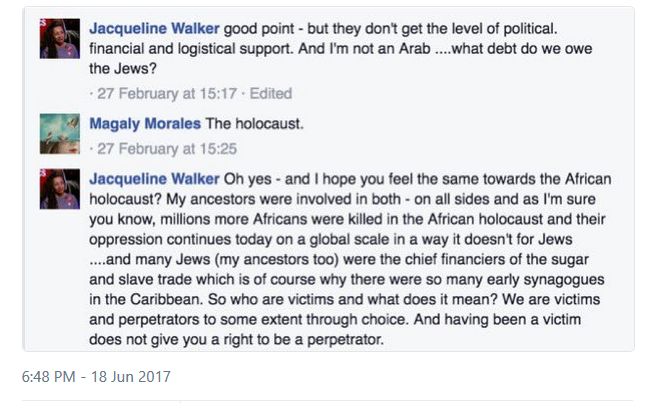 Ms Walker has persistently claimed that complaints of antisemitism are used to silence critics of Israel as part of a plot to destabilise the leadership of Jeremy Corbyn; she has rejected the International Definition of Antisemitism; and while contentiously claiming to be Jewish, she has nevertheless alleged that Jews claim privileges at the expense of black people, only this week reportedly referring to Jewish Labour MP Margaret Hodge as “someone from the white millionaire elite” whom she accused of “black Jew baiting”. Ms Walker has acted as an outrider for the Labour Party and Momentum’s leadership, testing what is possible for prominent members to say publicly about Jews, even taking her bizarre “Lynching” show — in which she claims to be the victim of a “Witch-hunt” — around the country to applause from her Parliamentary equivalent, Chris Williamson MP. Meanwhile, leaders of the Party who publicly affect to disavow antisemites in their midst, including John McDonnell, have defended her. It comes as no surprise that the institutionally antisemitic Labour Party waited almost three years to finally expel Jackie Walker. During those three years she has toured the nation, openly supported by leading Labour MPs, claiming that the case against her was trumped up. It is because Labour has shown itself to be incapable of addressing antisemitism cases in a fair, transparent and timely manner that Campaign Against Antisemitism brought in the Equality and Human Rights Commission to take charge. Labour’s decision to finally act now that the Commission is at the gate, is not a sign of change, but merely an act of naked self-preservation by a political party being brought face-to-face with its own racism.